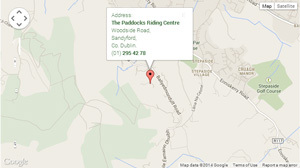 Pony Camp - Horse Riding Centre Dublin, riding lessons, livery, horses riding school, stables, pony trekking, equestrian centre, Dublin Mountains, Wicklow, Ireland. During the school holidays, we will be running two pony camps. Our fantastic and super fun regular pony camp for the the whole summer and also an Advanced camp for a week or two during the summer. Details for both are below. Please call for more details for either on 0872237981. We have a super pony camp running Monday to Friday for every week of the summer. Choose to one day or the week, we would love to see you. The camp day is split into two options, a half day and a full day. The half day is from 10am-2pm and includes one hour riding, two hours stable management ans lots of fun. The half day camp costs €45 per day or €200 (when paid in advance) for the week half day camp. The full day is 10am to 4pm and includes two hours riding, one of which is a fab ride into the mountains, stable management and games all through the day. The full day camp costs €55 per day or €230 (when paid in advance) for the week of full day camp. On Friday afternoon the campers have a jumping show that family and friends are welcome to watch and support. Early drop off and late collection available upon request. Children are asked to bring they're own lunch and snacks as food is not supplied. We also recommend that children bring rain jackets and a change of clothes. Hats and boots are available for campers to borrow. Places on pony camp will not be secured unless a deposit is paid in advance. We a holding the best advanced camp during the summer holidays. Advanced lesson every morning and an outing every afternoon with a massive end of week show. The date of the advanced camp is to be confirmed. The camp starts at 9.30 Monday, Tuesday, Thursday, Friday, camp on Wednesday starts at 9am. The camps costs €? per day or €? for 5 days. Children are asked to bring a full packed lunch everyday. Paddocks jackets or jumpers are required for outings. Please call 087223798 for any details. We are looking forward to see everyone for what is gong to be the most fun week!!! Every morning campers are divided into groups according to riding experience and age. If campers have come along with friends, we of course try to keep them together whenever possible. The morning session includes a one hour lesson with a qualified instructors and stable management. The afternoon session also covers stable management and an exciting one hour ride into the forestry of the Dublin Mountain. Campers are under supervision by staff at all times. Please find further details below. Lessons are super fun but yet campers are learning to ride with a fully qualified instructors. Riders are matched to ponies of suitable standard and size. Campers may give requests to certain ponies and staff will endeavor to make this happen. Lessons are catered for the varying standards of the group. For beginner lessons, campers will learn to control they're ponies, safety, trotting and and introduction to jumping. For more advance riders, the group will learn more technical riding on both flat and jump in a fun and relaxed but safe environment. All lessons will have the opportunity to play some pony games. Campers doing the full day will be riding into the mountain in the afternoon. It is amazing up there. The campers of novice standard do a walkout were there are helpers walking alongside and holding the riders and ponies. They trek up and down through forest and telling stories of what they've seen and heard, singing songs, playing games and having so much fun. But yet learning about balance and control of the ponies. For riders of more experience, they do a ride out so they can do some trotting, cantering maybe even galloping!! On both ride outs and walk outs, campers are accompanied with instructors. We have hats and boots that the campers can borrow. Should they wish to bring their own, wellies are ideal or any boot/shoe with a flat sole and definite small heel. No runners please. Rider are more than welcome to bring along their own equipment. A member of staff may check equipment to make sure it is up to the latest safety standards. Comfortable clothes can be worn, such as leggings, fitted jeans, tracksuits bottoms (not too baggy) or jodhpurs. Warm clothing is a most during the winter and spring months. Every camper should bring along a rain jacket and rain trousers if possible. We recommend that campers also bring along a change of clothes. During summer months, you might want to pack some sun screen. Campers should bring along a full packed lunch. They are offered to have a snack around 11am and lunch is at 1pm. Food is not supplied by the Paddocks. A drink also is essential. Horse riding can be thirsty work. Lunch is had in the box room where there is a fire lite on those raining, cold days. Children are supervised at all times during lunch. Any medication should be reported and given to a member of staff and details of same with instructions should be written and signed by guardian. Our summer Pony Camp will be running Monday to Friday of every week of June, July and August. Everyday we have an half day camp and a full day camp on offer. Children from 3 years of age to 17 years of age of all standards are welcome. Children will be divided into groups on the morning of each day according to age and standard. Please print and complete the following Registration Form and Waiver Form and hand into office prior to your riding session.